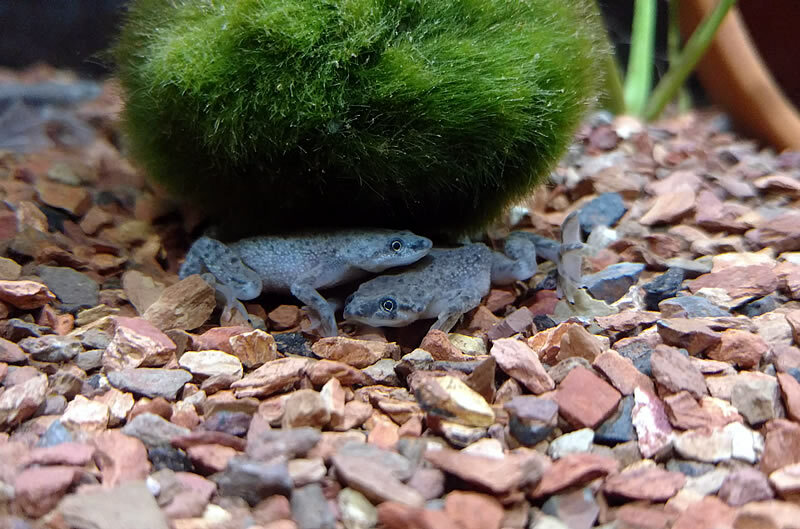 Adding live plants to your African dwarf frog habitat has many advantages. 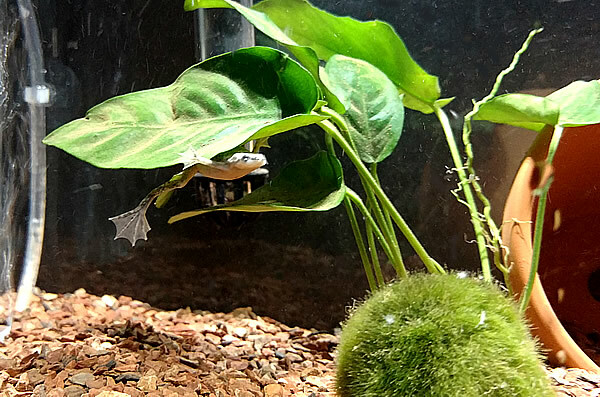 Aside from giving your frogs natural-looking places to hide and making the habitat more interesting and attractive, plants help remove ammonia and nitrates from the water and will help slow nitrate buildup. This may result in less-frequent need for water changes. I mainly keep plants in my aquatic habitats for the water-quality benefits, so one of my favorite aquarium plants is hornwort. It's one of the most effective of all aquarium plants at sopping up toxins. It also can be used either as a "rooted" plant by tying it to a rock or suction cup and anchoring to the bottom, or it can just be left floating at the top of the water. It's one of the easiest aquarium plants to care for. Dwarf Anubias (Anubias nana). Petite, easy to grow aquarium plant. Frogs love hiding under its leaves, as the picture on the top of this page illustrates. This is one of the plants in the tank I'm using for the froggy cam. Anacharis (Egeria densa). This fast-growing plant is a good water purifier, but may be illegal in some places where it is considered an invasive weed. Amazon Sword Plant (Echinodorus amazonicus). Easy to find and easy to care for, but does need quite a bit of light to thrive. Java moss (Taxiphyllum barbieri). Another easy plant that's a good water purifier. It can be used to make a nice "carpet" for the floor of your frogs' habitat. Almost impossible to kill, but needs a lot of light to grow best. Java fern (Microsorium pteropus). This hardy plant doesn't like to be rooted in a substrate, so it's a good choice for a tank with a bare floor. It should be tied to a piece of driftwood or lava rock and the roots left exposed. They will eventually attach themselves to the driftwood or rock. Real Marimo moss balls (Aegagropila linnaei). I say "real" because there are a lot of fake Marimo balls being sold, even by major retailers. Real Marimo balls are actually a spherical algae, not a moss. They're so good at absorbing and storing nitrates from the water that they should be removed from the tank, squeezed out over a sink, and placed back in the tank at every water change to release the toxins. I have one of these in the tank I'm using for the froggy cam. If you're just getting started, you might want to consider buying a package of assorted aquarium plants. It's a quick and easy way to get your habitat planted in a way that's interesting and natural-looking. If you have no interest in plants other than to help keep the water clean, you can just go with some floating or anchored hornwort and a real Marimo ball or two. They require practically no care, are nearly impossible to kill, don't need a substrate, and will help keep the water clean and healthy. I advise new keepers to stick with simple, inexpensive plants that are easy to care for. You'll still be learning to care for your frogs. You don't need to add the task of learning to care for delicate or hard-to-raise plants at this point. Any of the "beginner" aquarium plants that you can find at your local pet shop should work and your frogs will like them just fine. All plants require light, but not all plants require special plant lights. Most "beginner" aquarium plants will survive well enough with nothing more than a standard aquarium light. If you want the plants mainly for their water-quality value, then that's probably all you need. If you decide to venture into more exotic plants, however, or if you just want your beginner plants to grow their best, then you should consider installing an aquarium plant light. The only substrate I use aquatic tanks in which I want to plant rooted plants is Flourite. It's basically a clay gravel that has excellent characteristics as a substrate for both plants and friendly bacteria. I do have to warn you, however, that it gets very dusty in shipping and MUST be rinsed before using it, otherwise the water in the tank will look like chocolate milk. Even if you do rinse it, it will still severely cloud the water for a while. It'll just clear up much more quickly if the Flourite has been rinsed properly. The best way to rinse Flourite is to place it in a five-gallon bucket (fill it about halfway), slowly fill it with water, stir the gravel, and let it overflow until the water coming out is clear. I usually do this outside using a garden hose, but I've also done it in slop sinks and bathtubs during the colder months. There's more about how to actually install Flourite in your tank on this page.